Figure Cafe Project. Yesterday I worked on making a nice cafe for my figures to hang out in, it sits ontop of a nice little deco table my mother made me ages ago. I made card board walls for each side and matched the paint as best I could to my wall colour. I made a little card board stage for my girls to perform on entertain each other. The Cafe is named Cafe Rock, and I made a little board with some prices of coffee, not sure if they would actually be that price, just guistimated. The girls hanging out at the cafe table, and Yuki hanging out neat the wall, I have a sofa coming that will sit against that wall for the girls to chill out on. The cafe food display, has yet to get some food for it, but that as well as the sofa I got on Ebay and should be coming in a few days or so. And as the display is a bit tall for the girls, but I wanted Mikuru to be able to serve over the top I made a little card board stool for her. All the card board was the boxes I had from my girls being delivered, hehehehe a good use for them I think. 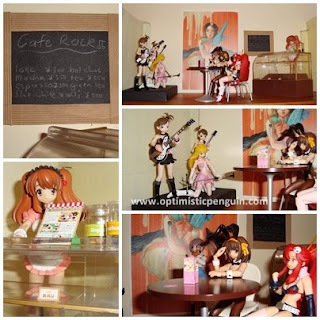 I am sure my girls will have a great time hanging out in this cafe and I will have fun coming up with comics for them.